The Dutch paperback version of Skinwalkers, published in Amsterdam in 1990 by Muntinga. Translated into Dutch by Wiebe Buddingh. 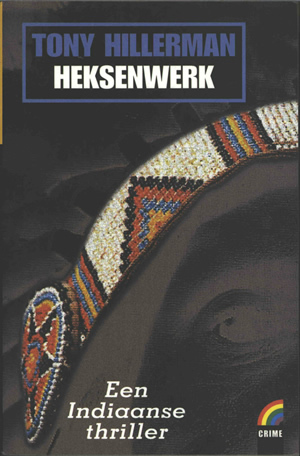 The full-color front cover displays the author's name and title superimposed on a reversed black-and-white photograph of the right eye and upper part of a human face, wearing a full-color beaded headband over the forehead. At the bottom front, "Een Indiaanse thriller" is printed in white near the Rainbow Crime logo. The upper third of the spine and back cover has an orange-yellow background, while the bottom two-thirds has a black background. On the back cover, the text from the front cover is repeated at the upper left. In a white rectangle superimposed over the yellow and black background, a synopsis, praise, and brief author bio are printed in alternating paragraphs of black and red text. The bar code is in the bottom left of the back cover, and the Rainbow Crime logo is in the bottom right corner. On the spine, the author's name is printed in the yellow third, and the title and logo are printed in the lower, black section.